Maximaliseer uw tijd in het prachtige Mexico tijdens een dagexcursie naar Puebla en Choula vanuit Mexico-Stad. 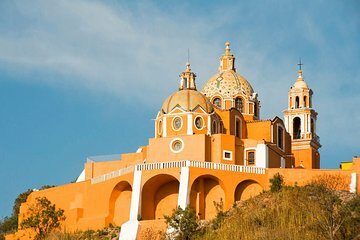 Ontdek met een deskundige gids het rijke culturele erfgoed van elke stad, bezoek de adembenemende kerk van Santa Maria de Tonantzintla in Choula en bewonder het prachtige historische centrum van Puebla. Proef Puebla's verleidelijke scala aan culinaire hoogstandjes (op eigen kosten) en blader door een traditionele ambachtelijke markt voor speciale souvenirs. Very interesting view of a typical Mexican city, but i was interest in knowing more than churches. Great guide, anyways. Puebla and Cholula were beautiful cities and I recommend seeing them. However, as a day trip from Mexico City it was a little too much driving for one day. I felt we spent most of the day in a van as opposed to walking around the cities. By the time we got to Puebla it was already lunch time. Everyone in our group went to the same restaurant. I did not pay for the lunch option, but ended up going because I felt like I wasn't really offered the option of going elsewhere. I was disappointed with the buffet, but it was easier to stay with the group. We got to see an antique market, which was cool, but ate up most of our time. I wish we could have spent more time touring the city and its architecture instead. It would have been nice to have been given more guided instructions for a free time than just to check out the market. I would have rather been given directions to see one of the cathedrals or some other portion of the city. A parcel of colonial cities in Mexico are a must-see. Puebla and Cholula are novel in historical, cultural and on-going contexts. The current vibe exudes and will be back to explore these at leisure. Additionally, the Puebla Parian Market was an eye opener on the look-out for black clay sculpture or vase with engaging locals that were easy going and relaxed. This English speaking tour was mostly done in Spanish to the detriment of my spouse who was lost. The frequent reminders to the guide did little to to make the situation better. Had to do the translation. Saludos, hasta que nos encontramos otra vez! Puebla town is really nice but we didn't have enough time to explore it. This tour is good if you just want to have an overview and get a feel for the area. If you really want to immerse in and soak in the culture of the town, suggest to go there yourself and spend an overnight so you have more freedom to roam about. Il n'est pas possible de visiter l'église sur le dessus de la montagne depuis le tremblement de terre de septembre 2017, ce qui enlève beaucoup d'intérêt pour ce tour. J'aurais aimé visiter la pyramide, mais cela ne fait pas partie de ce tour. Cool Trip, liked Puebla the best. unfortunately the churches and most important places were closed due to the earthquake, so we did not get to see the highlights. Mauricio was an excellent driver to cope with the horrific traffic. We sat more in traffic jams than at the sights. The guide Roberto was quite mediocre. He did not stick around when we had free time to shop, neither at lunch . Nobody explained the foods at the buffet. On the way back Roberto gave zero information. Talked the entire time with the driver.